Last Thursday Jim Bennett, the father of Israel’s Education Minister Naftali Bennett, passed away. The story below describes one way Jim Bennett touched my life and that of my family. I wrote this about Jim and in his honor. Jim Bennett’s passion for genealogy and willingness to help a pre-Bar Mitzvah boy research his family tree created ties that did not previously exist, brought a measure of healing and comfort to a survivor of Auschwitz which enabled him to lay tefillin for the first time since Kristallnacht. In a lifetime of incidents, I’m certain Jim’s generous spirit touched and brought positive things to many people. In this story, all the people involved happen to be part of Jim’s own family tree. Maschkowski is an unusual family name. When he began researching his family tree, 12 year old Tal didn’t think there would be much to find. As far as he knew there weren’t other Maschkowskis in the world aside from his father, younger brother and grandmother. Tal’s extensive research on the internet, the Yad Vashem database and numerous phone calls to try to locate a witness with information uncovered little. Lenny, Tal’s father, then remembered that when he was a child his own father, Zvi, had told him about a realtor from the Anglo community in Haifa that had interviewed him and documented extensive information about their family tree. Zvi who normally did not to share personal information with others, surprised himself with the amount of information he revealed and discussed with the charismatic realtor / genealogist – Jim Bennett. Jim made himself a name in Haifa as successful realtor however he had also taken his hobby to an unusual level of expertise and had become a highly knowledgeable genealogist. Jim’s interest in the Maschkowski family stemmed from the Israelski family, a branch in the Bennett family tree that joined between them and the Maschkowskis. After searching the net and around the world, the answers were to be discovered right around the block: the Bennetts and the Maschkowskis were neighbors. Tal, Lenny, Mor and I arrived at the Bennett house at the appointed time. Jim was sitting by a coffee table covered in documents. Jim’s wife Myrna greeted us pleasantly. One look at the papers spread everywhere conveyed her thoughts: “Oh dear, that genealogy stuff again?” Very quickly she announced that she needed to go out for errands and left. Jim proceeded to give us a fascinating history lesson. He spread out the entire Maschkowski family tree, dating back to the late 1700’s when the East Prussian government decided to take a population census and, for organizational purposes, insisted that everyone adopt a permanent family name – thus Kalman son of Moses became Kalman Maschkowski, the first Maschkowski. In an instant, the small Maschkowski family we knew, grew to the much larger family that existed before the Holocaust and an opportunity unfolded to discover Maschkowskis alive today. We learned that one of the Maschkowskis would soon be visiting Israel and we arranged to meet with him in Jerusalem. Gerhard Maschkowski is approximately the same age as Lenny’s father Zvi would be today, were he still alive. Their life stories are similar, they grew up in neighboring towns and the families visited with each other. Zvi escaped the horrors of the Holocaust when his parents sent him via the Kindertrasport to England. Gerhard wasn’t so lucky. He ended up in Auschwitz. Surviving was a real miracle. Gerhard was there for about two years while most survived only a number of months, weeks or even less. An impressive man, Gerhard is a man full of smiles. He is both willing and able to tell of his experiences during the Holocaust and somehow manages to do it without allowing his memories to damage his positive outlook towards life. No man can truly replace another but Gerhard is like the father Lenny no longer has, like the grandfather Tal and Mor don’t remember. And the opposite is also true – Gerhard, who had children of his own but no grandchildren felt joy to discover relatives alive and well in Israel and comfort in knowing that Tal and Mor are the living continuation of his name. When he passes on, the Maschkowski family name will not die out. Jim Bennett’s passion for genealogy had ignited a series of meaningful events. And it didn’t stop there. 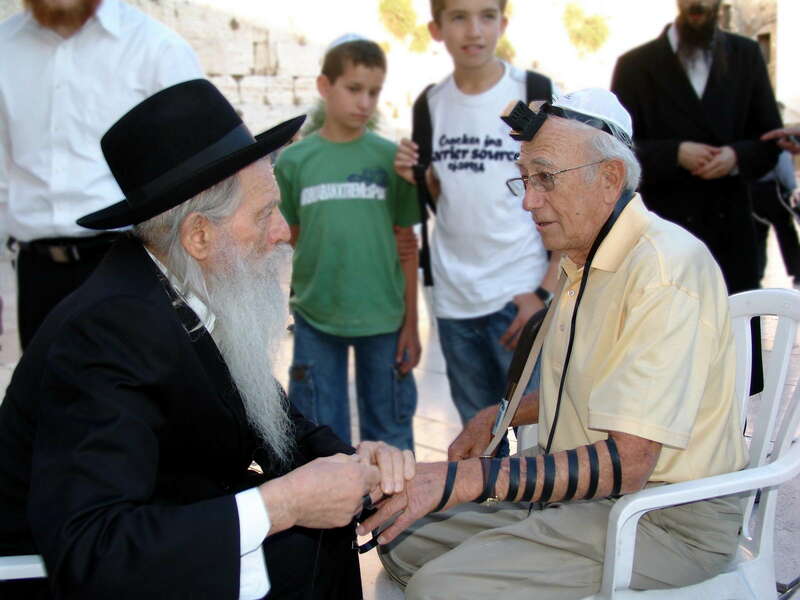 The man told Gerhard: “You should put on tefillin.” Gerhard resisted, telling him that although he observes all the Jewish holidays and traditions he had not put on tefillin since his had been reduced to ashes on Kristallnacht. The man insisted until finally, Gerhard gave in. For the first time since he had arrived in Israel, Gerhard’s smiling eyes filled with tears. He put on the tefillin and with the help of the man he had never seen before and repeated the prayer that goes with it, the promise between God and his people – eternal faithfulness, loving kindness in righteousness, and in judgment and in mercy. In a way Gerhard is a living example of this promise. He told us that although he knows that many survivors believe that God had abandoned them he knew that he had survived the horrors of the Holocaust by, not one but many, miracles and miracles supposedly come from God so maybe God was there all along. Jim Bennett, with his research and his enthusiastic generosity in sharing his knowledge, set the stage for the events described here. Without him, we would never have met Gerhard, Gerhard would never have known that his name will continue and he would have let the Nazis decide when would be the last time he touched tefillin. What a blessing that Jim was gracious enough to share his family tree with us. In doing so he enabled connections written on paper to become tangible, family ties. What a legacy to leave behind! I would like to get in touch with whoever wrote this article. My name is Gunter Maschkowski. I am one of the grandsons of Gunther Maschkowski. Want to know more about Maschkowski family.